In Summer 2015 our incredible journey has come to an end. Matteo and I have finished our trip around the world on our motorcycles. The trip started in 2012. When we started, i remember many discussions we had about the probability that such an experience would have on our lives. It sure did. Our priorities in life have definatly changed. I can still remember when I left Italy for the first segment of our journey as if it was yesterday. The first segment took us from Italy to Mongolia. We crossed Greece, Turkey, Georgia, Azerbaijan, Turkmenistan, Uzbekistan, Kazakhstan, some Russia and finally Mongolia. The bikes were so heavy we could barely drive them. We then continued our travels eastward toward Japan by crossing Siberia via Sakhalin island. I then travelled From Victoria BC to Inuvik in the far North West Territories of Canada. Later again from Victoria all the way down to the southern tip of Argentina across North, Central, and South America. It would have not been a real around the world without travelling across Africa which we finally did in 2015. Looking back we can’t forget the expression of the many children we encounter during our travel. Helping children along the way has always been our main mission. For this very reason, our objective was to select one orphanage per continents we were to cross. In Mongolia we chose ” Kindergarden 58 “. 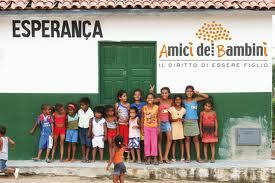 In Bolivia the ” Virgen de Fatima“, and in Africa the “Tumaini Children Foundation“. With the help of family and friends we were able to raise enough founds to make a small difference in the children’s every day life. TUMAINI CHILDREN FOUNDATION. TANZANIA – AFRICA. Some words have to be said about friendship. Many of you know that Matteo and myself did not know each other before this adventure that took us literally around the globe. We had met the year prior to our departure while I was on a different trip in Turkey with other great friends of mine. It took a couple of emails between Matteo and I to decide to go. In any case it turned out to be an amazing partner for this kind of challenge. We complimented ourselves in any situation we encounter. A particular situation raised in Colombia, where during an immense protest by the farmers, we were stopped and not allowed to proceed for four days. Or in Siberia Russia, when a group of Russian marines surrounded us for what became the worst night of my life. I honestly don’t think we would have done it without each other support. Most important is that we have been able to build an incredible solid relationship that will last until the end of our lives. We are now back into our everyday life with a great deal of fun memories and much more experience. Talking about our life at home we both have to look in the eyes of our loved ones and without words try to express our gratitude for letting us doing this experience with ease and love. I personally owe so much to my wife and kids that have been so patient with me during this time. Matteo and I in Greece. Matteo, Asimo, and myself in Tokyo. HONDA HEADQUARTER. Lot’s of hotels to choose from….. I would be happy to. Send me a mail on the contact form. Cheers. Hello Laurence. I would be happy to help you any way possible. I live in vancouver now. My email is mototravellersinfo@gmail.com. Thank you for your web site ! I found a lot of informations to prepare our world-tour ! we ll go on may from France to Japan (DE-PL-UA-RU-KZ-MGL-RU-JPN) and we’ll take by AIR CANADA flight to go to vancouver. do you have more informations for us to do exportation documents? Hello Jon, Thanks for your kind words. 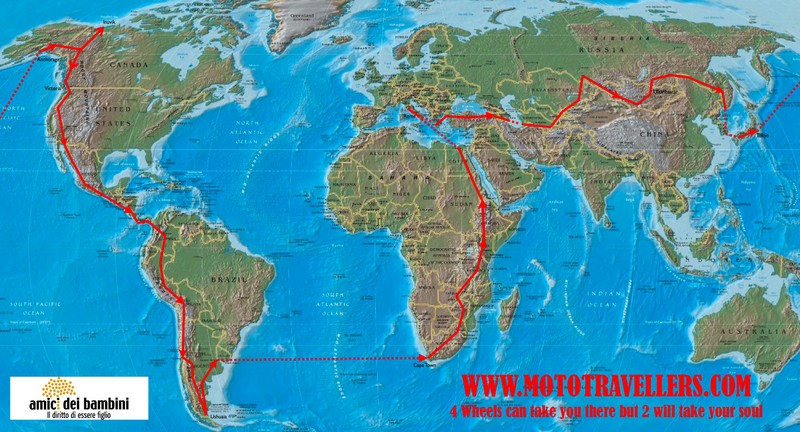 Keep following us as this year we plan to travel the PAMIR HIGHWAY. Say Hello to Sweden from us. LOVE Sweden. Cheers. It was so nice to read your summery of your journeys around the globe. You are true inspiration and we everday guys need to read and watch your adventures so we can dream. And hopefully we too Someday will do something similar.